Selling on TpT can be completely overwhelming. Not only are you trying to make new products, but navigating the world of marketing leaves you wondering, how much time should I devote to creating new products, and how much time should be devoted to other tasks? Here are some things to consider and what has worked for us. If you don’t create, you’ll have nothing to market. 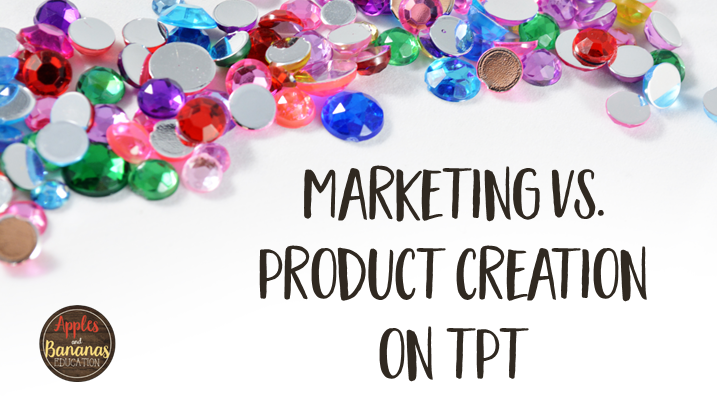 When you first get started on TpT, your number one priority should be creating products. If people do find your store, you want there to be something in your store to look at! We know that it takes time, a lot of time, to create quality resources. Creating resources takes more time than any other task related to your TpT store. Make it a priority initially before marketing pulls you into 100 different directions – believe us, it will! Use accurate titles, detailed descriptions, and excellent previews as one way of reaching your audience. If you correctly name your product, there will be a much higher likelihood that it will be found through the TpT search. After naming your product, be sure to log out of your account on TpT and see where you product lands in the search results. Don’t get discouraged if you aren’t near the top. Think like a buyer and use the most important words first in your title. Don’t name your product Dolphin-Themed Place Value Game because no one will enter “dolphin-themed” first into a search bar. Instead try Place Value Game – Dolphin Theme. This small change will make a big difference. A detailed description and great preview will set your products apart from the sea of less-serious sellers. Remember to only tag the grade level/s that apply to your product. You will get penalized for tagging more than 4 grade levels. Do not rely solely on the TpT search. The TpT search continues to evolve. With thousands of sellers, you cannot be guaranteed that buyers will be led to your products through the TpT search alone. Many people blame their lack of sales on the fact that there is too much competition on TpT and it’s hard to stand out. That is why it is absolutely essential to find your ideal buyers through other means. It may be a steep learning curve, but the payoff is worth it. If you are like most people, you don’t have all the time in the world to become a social media guru and to market your products in every possible location online. Find out the types of marketing that lead to direct sales and do it quickly. Pinterest and blogging are two of the biggest areas for TpT sellers. Many sellers spend time on Facebook, Instagram, Twitter, Periscope, and Snapchat, but these forums are better known for connecting with others and building a following, rather than always leading directly to sales. So if you have a limited amount of time, make good, rich pins showing your product in use, and then keep an eye on the traffic on your dashboard. You can always add other types of marketing down the road. Posting new products on TpT is a form of free marketing because your followers will see your updates on their TpT homepage, as well as in their “Sellers You Follow” emails. You can also use your monthly “Note to Followers” message to reach out to your buyers. Connect with other sellers to learn about giveaways and contests that can extend your reach. The key is to recognize that you can’t do everything all of the time – just be sure to devote come consistent time to marketing and don’t let it fall by the wayside. The below tips are what has worked for us in helping to reach our first and second milestones. We definitely have not stuck with this formula 100% of the time – there are certain times of year where we are in “create” mode and other times when we need a break and just pin or connect with other sellers. All of it helped to propel our store forward, so give yourself a break if you find some days (weeks, months) more productive than others. We are lucky to have two of us working on our store, so one of us is able to focus solely on product creation and the other of us (yours truly) can split time between product creation and marketing. Many sellers outsource certain tasks to virtual assistants or use management systems to help them with the marketing efforts. Do what works for you and know that this may change over time. Remember that marketing is designed to help people find your store, but offering quality products will be the key to getting buyers to follow you and come back for more. Spend your time where it counts and refocus your efforts if you find your world pinning out of control. These are great tips and reminders – and it’s good to know what has worked for you and your very successful store. Thank you for sharing!